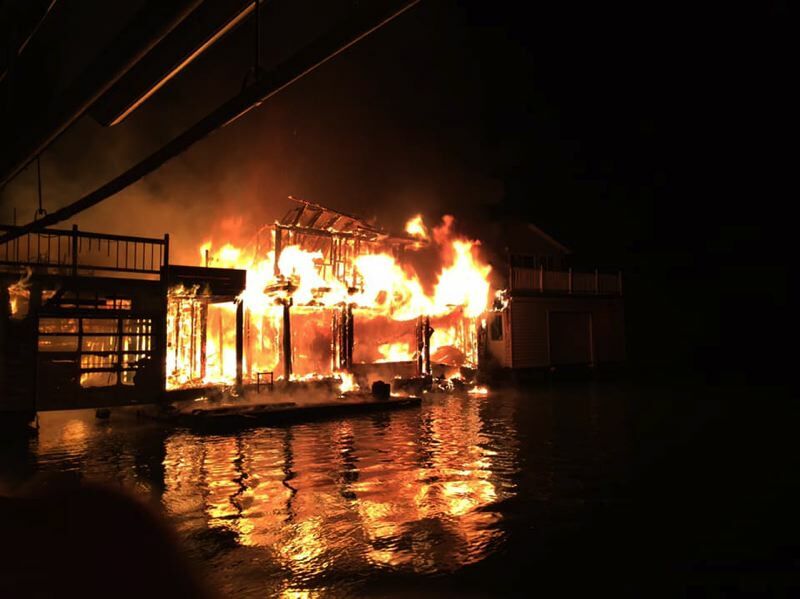 Three floating residences at the Multnomah Channel Yacht Club, just three miles east of Scappoose, were destroyed Tuesday, Feb. 5, after a fire broke out in one home and spread to several others. Emergency responders from multiple agencies in Columbia County responded to the blaze just before 6 p.m. Scappoose Fire District officials were dispatched at 5:58 p.m. and found one floating home fully engulfed in flames upon arrival. Crews worked to prevent the blaze from spreading to nearby structures, but the flames did eventually reach two homes nearby. Multiple fire agencies including SFD, Columbia River Fire and Rescue, Clark County Fire and Portland Fire responded. Three fire boats were on scene and the Scappoose crew stayed at the fire overnight to monitor for hot spots and secure the scene. Engstrom said. Additionally crews from Scappoose Police Department, Columbia County Sheriff's Office and Columbia River PUD assisted at the scene. One of the homes destroyed was a full time residence for one couple, Engstrom reported. The couple were able to rescue their dogs from the blaze, but believe their cat did not survive. The couple is receiving assistance from family in the area. "[There were] no injuries. That's the good thing," Engstrom said. One of the other homes destroyed was vacant, and the other was only occupied part time. Several boats near the fire also sustained heat damage as a result of the blaze. The cause of the fire is still under investigation. Engstrom said she expected the Columbia County Fire Investigation team to be on site throughout the day Wednesday. "As of 9 a.m. the Columbia County Fire Investigation Team met and they will the entire day on site," Engstrom said. "Because with something like this. fire and law enforcement are trained in it. Some do interviews and some are trained in the fire aspect." It is not clear how long the investigation will take.